I'm not going to harsh on this book, which is handsome and thorough and full of information and dreamy photographs of tile-roofed stone farmhouses and braids of garlic and cafes in Sevilla and Zaragoza where I would rather be right this second drinking a glass of anything. Teresa Barrenechea did a good job. I like this book. I like to look at it and read it. I just didn't like to cook from it because the food didn't turn out very well. I don't know if the fault lies with uninspired recipes, flawed recipes, inadequate instructions, or my own shortcomings as a cook. Probably all four. I'm pretty sure I did something stupid while I was making the caramelized orange syrup for the leg of lamb the other night. But what? It's the job of the cookbook to guide the cook through the complications, to point out the pitfalls, to explain how a mixture should look and feel at a given moment, to tell you what not to do as well as what to do. Good recipes don't just dictate or instruct, they warn, describe, encourage, explain. Barrenechea's recipes don't really do this. 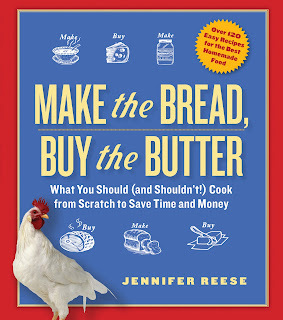 People have had a lot of trouble with the bread recipe in the cookbook I wrote and I believe it is my fault entirely. The bread is great; the recipe wasn't good enough. Anyway, for whatever reason Barrenechea's torta de Santiago turned out extremely dry; the coca with parsley resembled focaccia topped with lawn mower clippings; the marmitako seemed overly oily. Dish after dish, just not quite right. 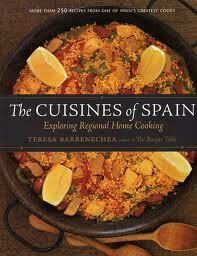 I made 15 recipes from The Cuisines of Spain. Shelf essential? Obviously I don't think so. oh, to be able to make good Spanish food! who wouldn't want that skill? and you're right--a cookbook is supposed to be a thorough guide (which is why i love Rose Levy Berenbaum's cookbooks. she gives so much detail that if one of her recipes told me to turn around three times before putting a cake in the oven i would). it's too bad that Cuisines of Spain isn't worth the bother, but your site is delightful! Your bread recipe is great! Of course, I still have to cut the crusts off for my kids, but I think it's super. Nonsense. Your bread recipe is fine. You deserve credit for courage. I can't imagine cooking a meal for the first time . . for COMPANY! i know tipsy well enough to know that the "brick" comment will cut her to the quick. she will probably track you down, come to your house, and give you a custom lesson on how to make that bread just to make amends. I really did not think that this was the fault of the recipe, but if Tipsy wants to come to sunny Cleveland and teach me how to make bread, I'm waiting! I didn't have great luck with your bread recipe either- but I had the same problems I usually have with bread (it was a brick), so I am clearly doing something wrong. Maybe you could clarify? The bagels on the other hand, were life changing. I made a double recipe and they were all gone within five hours.